Ken was born in 1938 at Franklin Road, Jacksdale. His family rented a brand new house which had been built in 1936 by Shipmans. It did have a bathroom but the only WC was outside. They went to bed by candle light as electricity was not installed until 1953 as his father would not pay for electricity to be installed in a house owned by someone else. His father used to say, “I could have bought the house for £25, trouble was, I never had £25!” Ken left school at 15 and was apprenticed at Stanton Ironworks till his call up for National Service in the RAF when he was aged 21. Lots of happy memories, on Christmas day a fire was made up in the front room and the radio carried in as a special treat. Church three times on a Sunday and no cricket allowed! 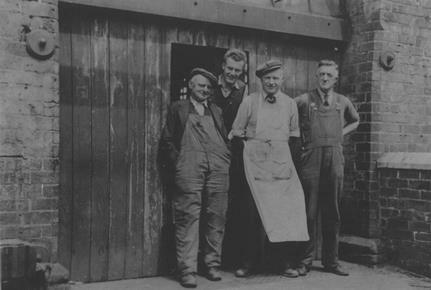 Ken’s mum said that “Sunday was Sunday!” But as Ken often says, “That’s how it goes!” Photo: Ken at Stanton Ironworks – Left to Right Jack Humphries, Ken Barnett, Bernard Denman, Cyril Mayes.